I am blessed to be a short drive to the mighty Mississippi River. Pool 4 of the Mississippi is my primary location to take my clients kayak fishing (see my business www.smallcraftoutfitters.com). It offers a vast variety of species, it is common to see several bald eagles, and other wildlife is abundant there as well. The views can also be breathtaking with the bluffs of Wisconsin. The river changes by the day and brings new challenges and mystery to the adventure. You never know what kind of fish will end up on the end of your line, what the water/beaver dams/other wildlife will allow you to explore. Disclaimer: With this beauty and mystery comes a high level of danger. Currents, barge traffic on the main channel, and a maze of backwaters. These can all get you lost, injured, or worse. If exploring them alone or for the first few times, be sure to be well informed by a guide or local. This time of year it is quite cold in Wisconsin and the duck hunters swarm the backwaters I frequent on Pool 4. 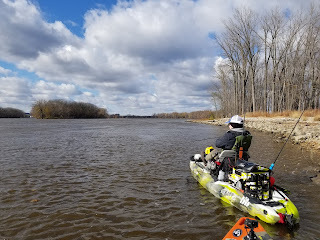 So Chang of www.cxfishing.com and I try our hand at the top of Pool 4 on the main channel in search for walleye (or anything willing to bite really). The morning starts out with 20+ MPH winds, rain, and some icy precipitation. Temperatures are rising from the mid/high 30s to the low 40s. Terrible conditions for kayaking, or even boat fishing. But with bitter cold and ice looming in our NW Wisconsin future, we forge ahead. 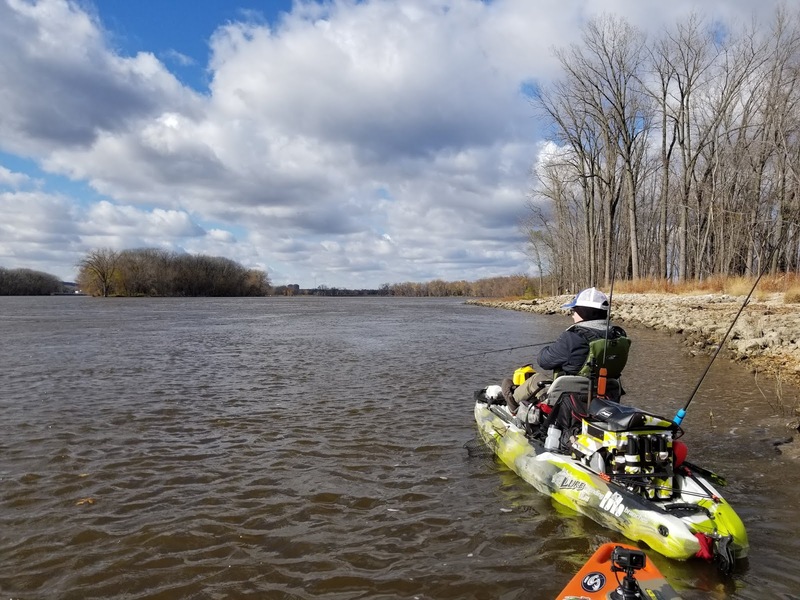 Our vehicles sway as the wind pushes our rooftop kayaks and vehicles while making the 45 minute drive to Everts Resort, our favorite launch location for winter kayak fishing. A few empty boat trailers linger in the parking lot. The place is usually busy, but the terrible weather seems to thwarting the usual crowds. We get a few crazy looks, and some people stopping with questions (as we usually do when fishing this big of water). A couple parking passes and scoops of minnows from the bait shop later, we are off. One of the most deceiving things of the Mississippi river is the current. From shore it is visible but not always easy to perceive. With the recent rain, a shove from the shore told us immediately we were in for a long day as it immediately shoved us downstream. Chang and I drop our pedals and start heading upstream (we always head upstream as not to trap ourselves downstream later in the day). As we pedal at our usual pace, the water is moving swiftly around us. We hear the familiar lapping of water on the keel indicating forward motion. The wind is gusting 10-20 MPH in our faces, but it feels good to be on the water. Then reality hits as I catch a glimpse of the boat ramp in my peripheral vision. Though pedaling at a normal pace, the fast current and strong headwinds are pushing us backwards! We kick it up a notch while watching the shore. We are finally making progress, though minimal. But we eventually bypass the launch and adjacent dock. 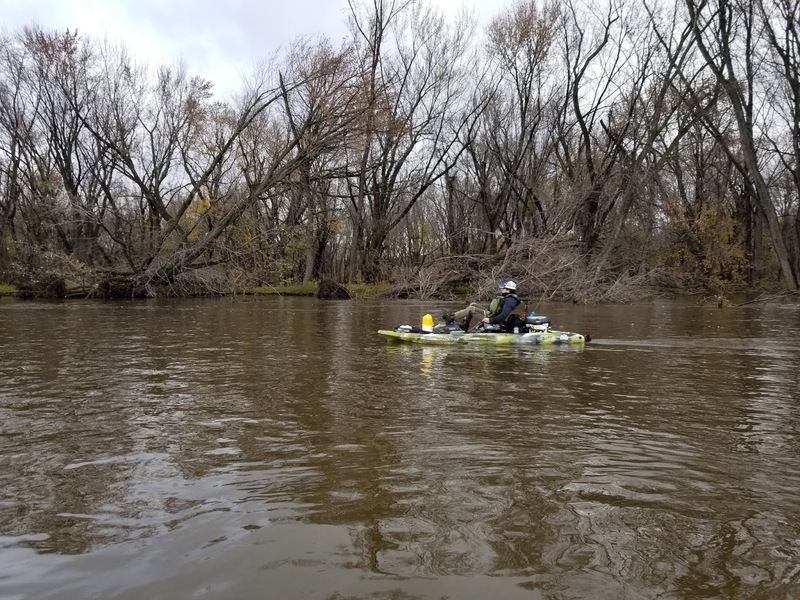 Everts is located in a slight bend in the river, so we hold to shore, aiming for the elbow of the curve where the current is noticeably slower and sheltered by the shoreline trees. We finally reach the elbow in the river near a channel marker. The current is still swift, but I can at least prep a rod without losing too much ground. I take this opportunity to quickly put a crawler on one of two Northland Tackle Crawler Hauler rigs I brought and dropped it to the depths below. The current takes the rig away from my kayak while I gently pedal in place. Once satisfied with the trolling distance, I close my bail and increase my pedal rate for gentle forward motion. A short time later, my rod bends aggressively. I give it a hookset to be sure and begin to reel, it is moving - fish on! I end up pulling in a nice rock bass, a species I don't often catch. We are hopeful this is a sign of a very active bite. Unfortunately, it wasn't. Fast forward a couple hours, we are about a mile upstream. We are pedaling hard to keep a meager forward momentum. If not for the thick woods at the shoreline, landing ashore and dragging the kayaks would likely be faster. The river shows signs of the summer flooding as we progress upstream. I am trolling two crawler haulers in rod holders off the back of my Feelfree Lure 13.5 while I pedal. Every once-in-a-while the rig and bottom bouncer catches on smaller brush, which I assume washed downstream from the summer floods. Exhausted from heavy pedaling in the swift current and heavy head winds, Chang and I are nearly out of steam. We round a slight bend and spot our target - the lock and dam delineating Pools 4 and 3 of the Mississippi River. We have fished that area before and done well. That is our goal. 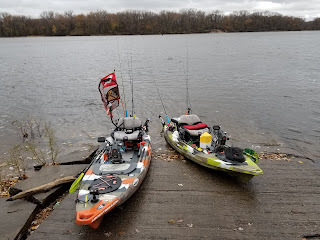 We round some walleye boats fishing about 10 yards off shore and aim for a section of rip-rap lining the shore. A perfect spot for bank fishing, lunch, and a break. Then the drag starts screaming on one of the rods I'm trolling. My heart rate increases, my adrenal glands are cautiously optimistic and release just enough adrenaline to make me forget about my exhaustion from fighting the current. 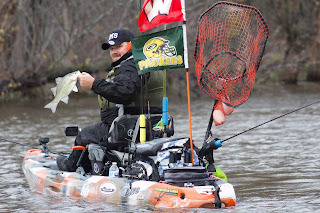 I grab my rod out of the rod holder, tighten the drag and set the hook. A solid hookset. The mystery fish at the end of the line is moving! I continue to fight what is surely a massive fish. It continues to intermittently take drag. I don't want to force it and snap the line. I look over my shoulder to see where Chang is and he is pedaling behind me, heading for shore. He has taken notice to my epic battle. My little burst of adrenaline has worn off and I opt to head to shore to remove the current from the battle. However, I notice Chang's efforts to pedal towards shore become more labored. And my "fish" fights anytime he pedals. Crap. 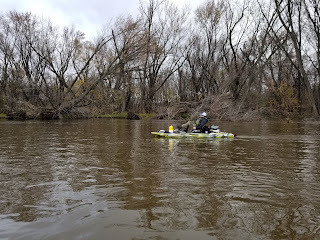 Long story short, we do an awkward pedal/paddle effort towards shore to get out of the current because it is carrying us directly towards a couple of walleye boats. We eventually are successful and Chang is able to pull his Feelfree Overdrive out, cut my line, unwrap it, and recover my Crawler Hauler and bottom bouncer without issue. Only a few yards from our rip-rap destination, we pull the kayaks ashore. We laugh the situation off, and I toss my remaining Crawler Hauler out from the bank as I prep my meal. But this adventure isn't over yet. The Mississippi never fails to surprise and amaze. Stay tuned for part 2 of this crazy adventure. You can get this blog delivered to your Kindle device or app automatically for only $0.99/month! All content in this blog is copyrighted and belongs to Tyler Thiede. All opinions are my own. Powered by Blogger.